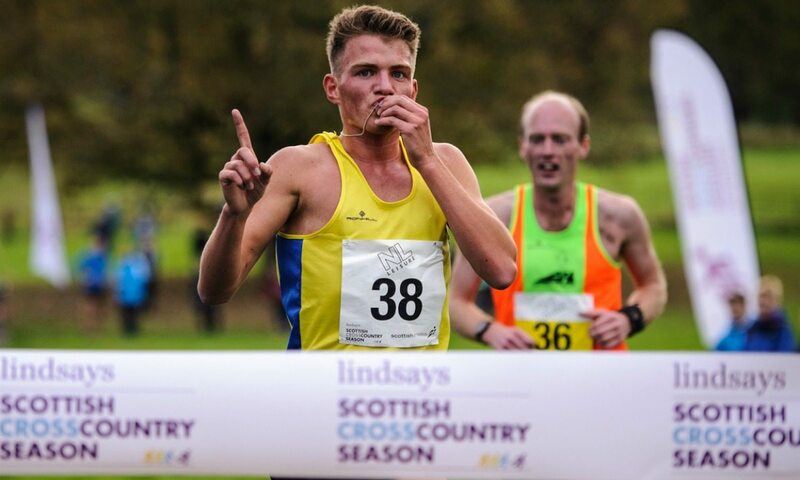 Olympians Andrew Butchart and Callum Hawkins each had good reason to smile after they swapped the track and roads of Rio for the Scottish National XC Relays at Cumbernauld on Saturday (October 22), reports Peter Jardine. Butchart led defending champions Central AC to victory in the senior men’s race on the country as coach Derek Easton’s squad made it five-in-a-row in that category. The ‘consolation’ for Hawkins was the fastest 4km leg of the day with his 11:01 on the third leg for Kilbarchan AAC some 21 seconds quicker than Butchart’s 11:22, albeit that the Central AC athlete was on the last leg with his team already well clear. Edinburgh Uni Hare and Hounds took second, with a couple of GB international hill runners in their quartet, with Aberdeen AAC on the podium as they took bronze. Aberdeen’s team included Rory Muir, younger brother of Olympian Laura. Students were very much to the fore in the senior women’s race as Edinburgh Uni took the title thanks to the efforts of Steph Pennycook, Catriona Graves, Louise Mercer and Mhairi Maclennan. Central AC took silver with the bronze claimed by a VP-Glasgow team including GB internationals Josephine Moultrie and Mhairi Hendry. “It was good to win it again – that’s five in a row for Central AC and I know it means a lot to the coaches and the club to keep being the dominant force at cross country,” said Butchart, who was sixth at the Olympics in the 5000m final and has broken two long-standing Scottish records on the track in 2016. “I definitely had the ‘glory leg’ this time with the fourth leg and happily the guys before me had it set up so well for me that I just had to get round safely! Michael Wright really had an excellent run in the second leg which made a big impact on the race and Jamie Crowe and Alastair Hay did well on one and three, as well. Kilbarchan were 17th in the men’s race when Hawkins set off on his 4km lap and the Great Scottish Run winner took them through to fourth with a scorching run, before they duly finished eighth. “I went off pretty fast and it was a shock to the system in many ways after marathons and half-marathons,” grinned Hawkins. Edinburgh AC won both the young females and the young males titles, with that a special achievement for the Carcas family as under-15 athlete Pippa took gold and then saw her brother, under-17 athlete Freddie, replicate that success. New club PH-Racing won the women’s masters race with Cambuslang Harriers making it six-in-a-row with their men’s masters win. Cambuslang also won the men’s V50 race, as Springburn Harriers took the women’s V50 golds. The event, which marked the start of the Lindsays Cross Country Season, drew its biggest entry in 24 years of joint championships for men and women.